Upper Missouri District Health Unit and Williston Trinity Christian School are partnering to provide flu shots to students, staff, and family members on October 17th, 1:00pm – 4:00pm. 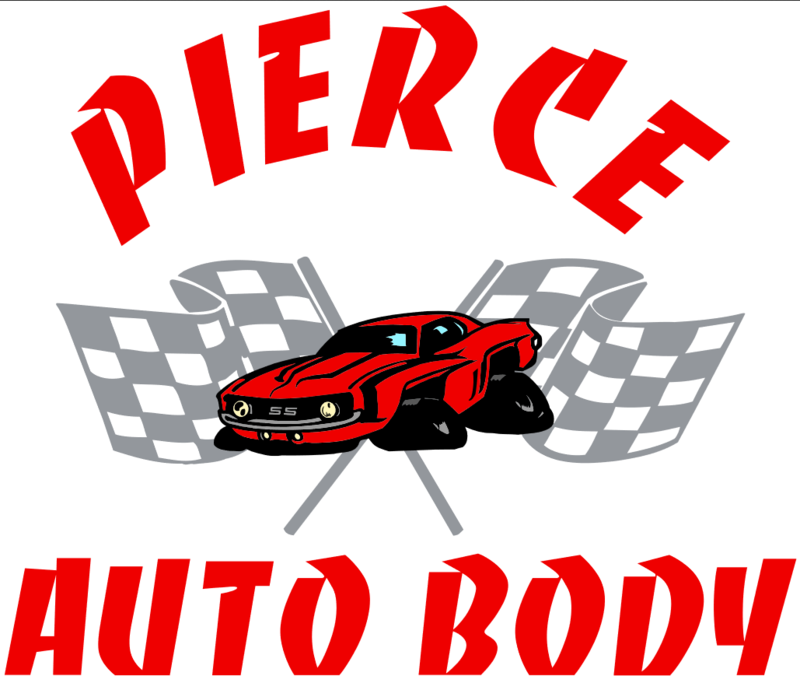 No need to set up an appointment, walk-ins only. UMDHU files insurance with Blue Cross and Blue Shield, Sanford, and Medicaid (ND Medicaid only). If you have a different insurance company, you will have to pay for the shot up front, and UMDHU will provide a receipt to send in to your insurance to determine reimbursement. The cost of the flu shot this year is $50.00. Anyone receiving a flu shot will need to fill out an influenza form which is available in the school office or online at www.wtcsnd.org. Please fill out the form prior to the immunization, if possible, to speed up the process. There is a front and back side to each form. Feel free to call the school office at 701-774-9056 with any questions. Bring Your Bible to School Day is October 4. John 1:5 says, “The light shines in the darkness, and the darkness has not overcome it.” With their Bible in hand, students continue to share the Word of God with classmates at WTCS and serve as a powerful example of Jesus’ love. PreK-5th Grade (& Preschool on Friday): Show your Bible to the office ladies for a sweet treat & prize. 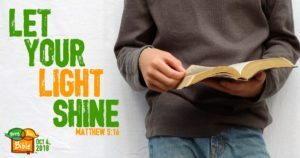 Grades 6-12: Bring your Bible to Chapel. Make sure your name is checked off! 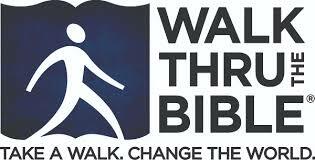 Those students who bring their Bible on Thursday will be able to wear SWEATPANTS on FRIDAY, Oct. 5th. Thank you to everyone who volunteered for the 2018 WTCS Annual Banquet & Auction! From students fluffing flowers, to parents taking down late Sat. night, we appreciate each and everyone one of you! Special thanks goes out to the Banquet committee – Board Member Jamie Lee, Liz Hirsch, Staci Haugen, Rebekah Crosby, Rebecca Winkler, and Dir. of Development Terry Haugen. It was a great night of fellowship & fun! 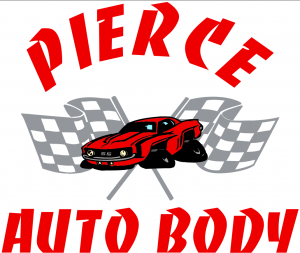 Thank you to our Platinum & Gold level banquet sponsors: Pierce Auto Body; Ceynar Chiropractic; Investment & Retirement Advisors; Bonetraill Bit Service; Go Wireline; Northwestern Mutual; Interstate Engineering; Red Rock Ford; Williston Basin API, Ward & Joetta Koeser; & PetrolShield. 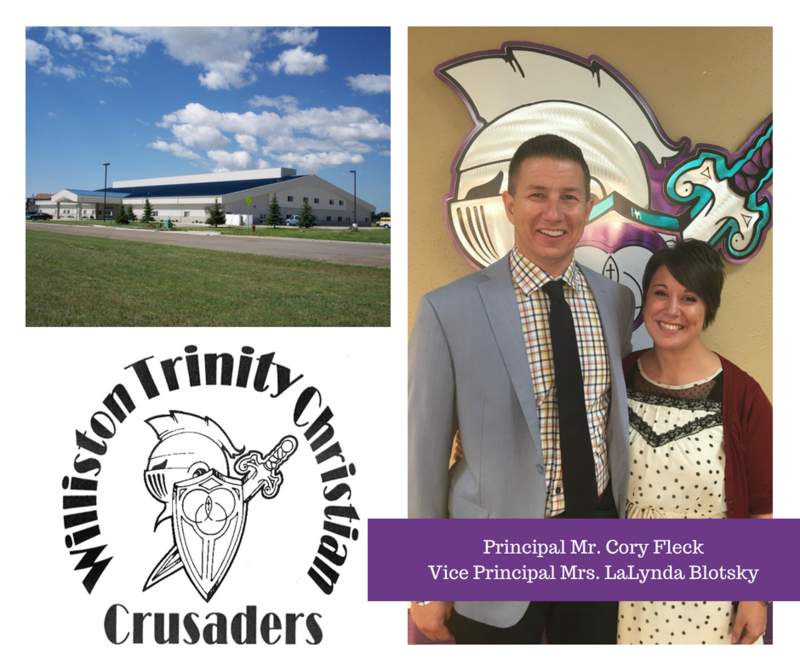 We appreciate your support of Williston Trinity Christian School & of Christian education in Western North Dakota. Monday, September 10: Spiritual Emphasis Week kicks off TODAY with “Walk Thru the Bible” happening at 9-10:30am & 1-2:30pm for grades K-5. Parents & family are invited to attend! This event is designed to education children about the Bible using highly entertaining, interactive methods. 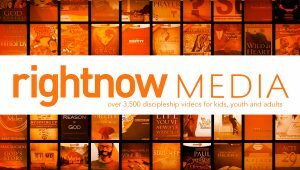 The goal is that each child has an overall understanding and is so EXCITED about the stories in God’s Word that they will begin to read their Bible daily. Wednesday, September 12: Spiritual Emphasis Week continues at WTCS. 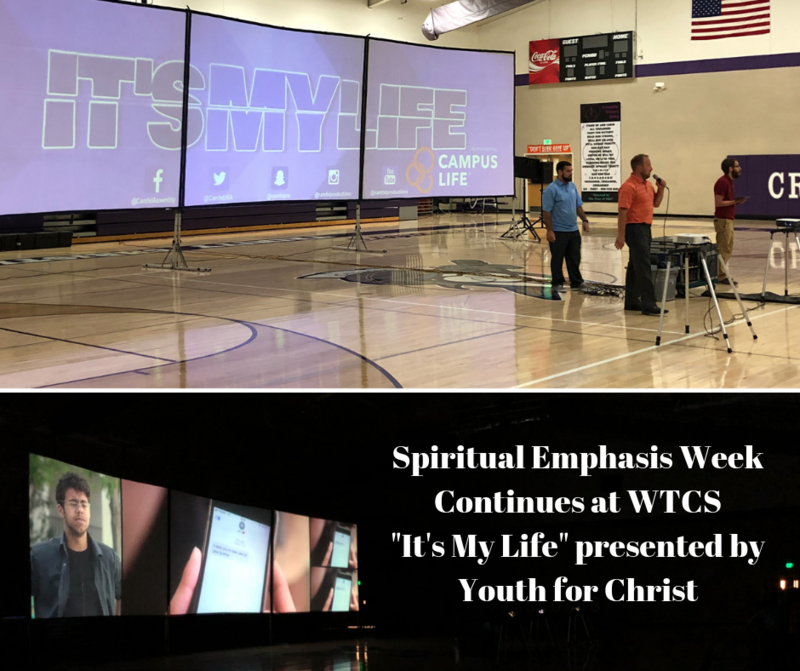 This morning, Youth for Christ presented a video “It’s My Life” by Cam Fell Productions. Students in grades 6-12 were asked to be respectful during the video presentation; and to learn something & be encouraged! The main takeaway from the presentation was to take responsibility for your life and make the right choices. Students were given two challenges for the day: Ask to see a smile from someone; and know that you are an Amazing Beautiful Creation of God. Check in with your middle & high schoolers after school today & see what they thought of the day. Williston Trinity Christian School is welcoming all the families affected by the devastating apartment fire on Thursday, Sept. 6th with FREE DINNER & A MOVIE! WTCS families are also invited for fellowship as we lift up these families in prayer. We are asking WTCS families to help with this meal by preparing potluck dishes to serve (main, side, dessert, drinks). This is our chance to bless these families, and it is a great way for WTCS parents to fulfill some volunteer hours! Free will donation will also be accepted as a contribution towards the families. A popular annual event will help raise money for Williston Trinity Christian School and spirits for those in attendance. 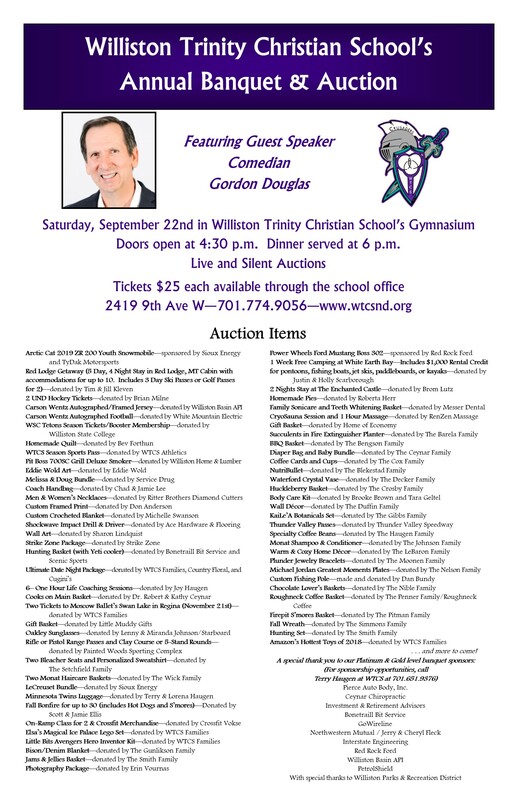 Williston Trinity Christian School will hold its annual Fall Fundraising Banquet and Auction on Sept. 22, featuring dinner, auctions and entertainment. Doors open at 4:30 p.m. with the start of the silent auction. The annual event raises funds to benefit WTCS, with both silent and live auctions showcasing a variety of prizes to entice participants. Terry Haugen, director of development at WTCS, said the auction is one of the highlights of the banquet. Attendees will be able to bid on a multitude of unique items, including a week long stay in a Red Lodge cabin, tickets to events such as the Moscow Ballet’s Swan Lake, hand-crafted furniture items and memorabilia autographed by North Dakota native and professional NFL player Carson Wentz. Haugen added that the auctions will also feature a variety of gift cards and baskets donated by local businesses and residents, and that their donations have been an important addition to the event. “We are so thankful for the amazing support that our business community and individuals are showing through their donations,” he said. This year’s entertainment is provided by comedian Gordon Douglas, who has been doing comedy for nearly 30 years, as well as being involved in the ministry. Douglas’ comedy has taken him to 37 states and four different countries, visiting a variety of schools and conferences, and has been featured on several tv and radio programs. The dinner portion of the banquet begins at 6 p.m., with the live auction and guest speakers rounding out the evening. The event looks to be an entertaining one, and WTCS Administrator Cory Fleck invites residents to come take part in the night’s festivities. “We hope the community will come out and support our auction and enjoy this fun, laughter-filled evening that we have planned,” he said. Tickets are $25 each, but are limited. 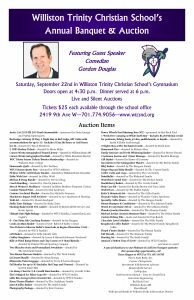 To purchase tickets or for more information on the Williston Trinity Christian School Fall Banquet, call 701-774-9056. All proceeds from the banquet and auction benefit Williston Trinity Christian School. 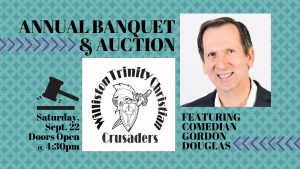 Annual Fundraising Event for Williston Trinity Christian School – Featuring a Live/Silent Auction & Comedian Gordan Douglas! Tickets are $25 & are available for purchase at Williston Trinity Christian School. Doors open for the silent auction at 4:30pm. Dinner is served at approximately 6:00pm. If you are interested in being a sponsor for our banquet and/or donating an item for this year’s auction, please contact the school office at 701-774-9056 or send us a message. Who is Gordon? He is someone who lives and loves to laugh! His comedy skills took him from the nightclubs in Philadelphia to Hollywood – and then ended up in ministry! Learning from his comedy hero Red Skelton, Gordon’s comedy mixes real life stories with “off the wall” physical comedy and his own hilarious view of life. He helps us see the funny things all around us and find joy no matter what we are going through. Besides his vast comedy background, Gordon was named Who’s Who in America’s Universities when he graduated from Philadelphia Biblical University in 1995. For the last 20 years Gordon has served as the head of the pastoral board of the Delaware County Pregnancy Center and regional coordinator of the National Day of Prayer. In his spare time he is still the President of Therapeutic Construction and Design- making custom equipment for folks with disabilities. In honor of his hero Bob Hope, Gordon started Operation Bellylaughs, sending comedy DVDs to the troops. Gordon Douglas has been married to his wife Dawn for over 35 years. They have five natural children and have opened their hearts and home to a whole lot more. Welcome to WTCS! 2018-2019 starts soon! 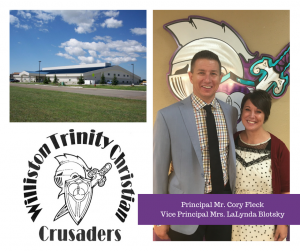 Williston Trinity Christian School has openings for the 2018-2019 school year in grades K-12. Preschool & PreK are full, but feel free to call & add your child’s name to the waiting list (we continue to fill openings as families move throughout the year). Why should you choose WTCS for your student? Williston Trinity Christian School embraces each student in a peaceful, family-like atmosphere. Classrooms (grades K-12) are at an average ratio of 1 teacher to 13 students! Because of the small class sizes, each student receives individualized learning by qualified Christian educators. Just a few reasons to become a Crusader! Consider WTCS for your student (& your family) today! 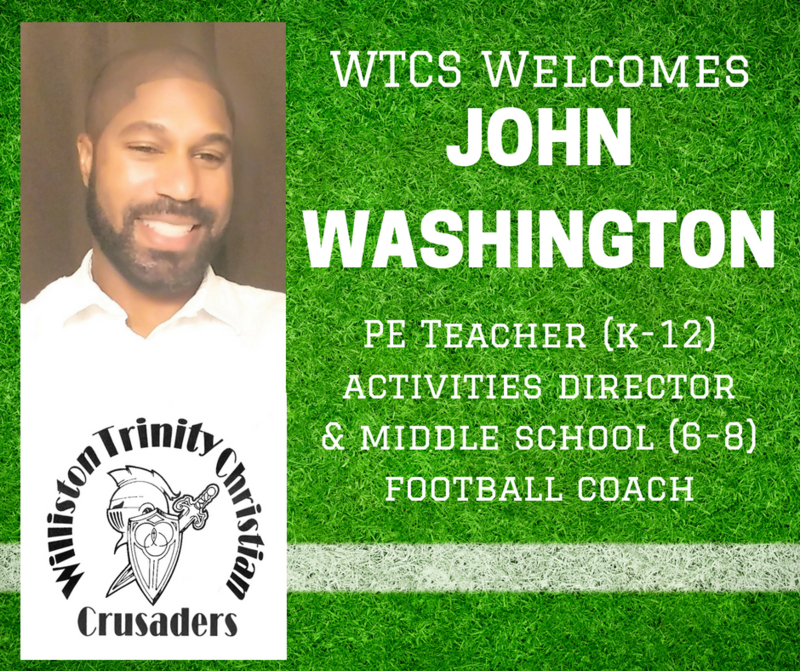 WTCS is excited to welcome JOHN WASHINGTON into the CRUSADER family as the PE Teacher, Athletic Director & Middle School Football Coach! Mr. Washington is a Texas Christian University alumni with three years of NFL experience. 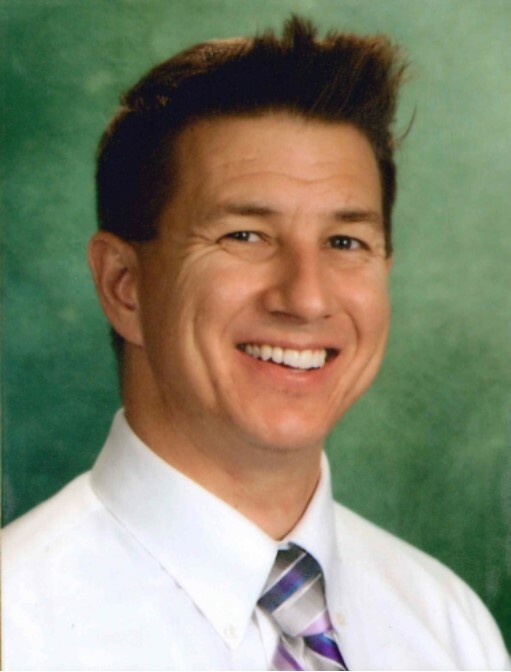 He has accumulated more than 15 years of combined coaching, teaching, leading, inspiring, and motivating students into becoming better citizens. 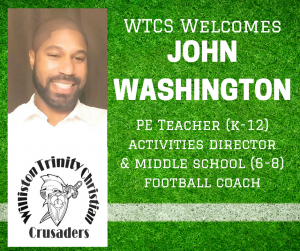 What will Mr. Washington bring to WTCS? *Consistently shown to provide leadership for students by exemplifying daily examples of winning character. *Utilizes the ability of coaching sports to implement life lessons to help students stay motivated & focused in hopes of living a prosperous life. *Led multiple track teams to state championship competitions on the junior high & high school level as well as football & basketball district champions. 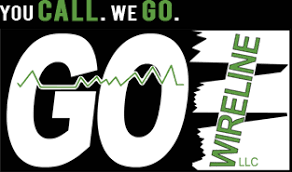 *Implemented athletic training programs that had an immediate impact in the overall performance of student-athletes. *Dedicated professionally and totally committed to inspiring & motivating the minds of our youth. It is going to be an AMAZING year at WTCS! Join us today!